Alvin Zhu appeared on Show 166, recorded in September 2007, at age 16. Alvin Zhu (piano), 16, from Pittsburgh, Pennsylvania is one of From the Top’s $10,000 Jack Kent Cooke Young Artist Award winners. A junior at Mt. 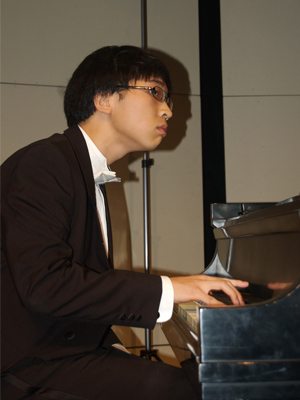 Lebanon High School, where he is ranked 1st in his class of 484 students, Alvin has won numerous piano competitions in his home state of Pennsylvania, including the Pittsburgh Concert Society Young Artist Award, and the Nittany Valley Symphony’s Ann Keller Young Soloist Competition. He has also performed live on Pittsburgh’s WQED radio. From a musical family, Alvin also plays violin, drums, guitar, and composes and conducts. He has performed as concertmaster of the Pittsburgh Haihua Youth Orchestra at the Sydney Opera House and at the Shanghai International Children’s Culture and Art Festival. Alvin is an expert at chess and says that climbing the Great Wall of China was one of his most memorable experiences. Alvin is a Jack Kent Cooke Young Artist.